The average home can expect to save a minimum of 20% on their monthly power bills with additional savings from free or very low cost installation of a home solar power system and increased property values. Conventional energy prices are at an all-time high with no end in sight. Conventional utility companies are subject to constantly increasing raw material and electrical production costs that they continually pass on to the consumer while maintaining their own profits. Advances in technology have increased the efficiency of solar panels while lowering the cost. As unbelievable as it may seem, in today’s solar market, the consumer actually gets more for less, opposite of what has been going on with most local utility monopolies. Solar power panel costs have dropped as much as 75% in the last few years. This coupled with aggressive clean energy programs has enabled home solar power to truly save a homeowner thousands of dollars annually on their electric bills, not to mention the increased property value. The higher your energy bill is, the more you save. Over 600,000 homes and businesses have installed solar power. 200,000 of these installations were in 2014 alone. 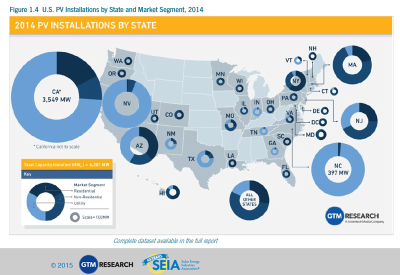 In 2014 solar power accounted for 32% of all new electrical power generation in the U.S.
It’s true! In many areas of the United States it is possible to get solar panels installed on your home at absolutely no charge and still save 20% or more on your monthly power bills. The combination of federal, state, local and utility rebates and tax incentives combine to make free solar power installation possible. Unfortunately, one of the big hitters in making free solar panel installation possible is the 30% Federal Tax Break and it is slated to expire at the end of this year. The impending demise of this generous tax program adds reason to act now rather than later. Check to see what programs your home qualifies for and start saving on your energy bills now !